1. How do I list a product with MPI? Choose the product category (MPI #) for your product. First read the product description in the MPI Approved Products List; if this is not enough information you can request some assistance from the technical director at MPI. Here is the description for MPI # 44: A white, or colored, water based latex-based paint with a low sheen finish. Used on primed/sealed interior plaster and gypsum board, and on primed wood and metal surfaces. Gloss level must be a maximum of 10 units at 60 degrees and sheen 10 to 35 units at 85 degrees. Other evaluated characteristics include consistency/viscosity, dry time, fineness of grind, hiding power by contrast ratio method, reflectance, alkali res istance, flexibility, scubbability and sealing properties. See MPI Detailed Performance Specs for complete details, specific requirements, and/or references. Contact Terrance Mayes, Technical Specialist at MPI terrance.mayes@mpi.net 740 438 6608 to receive a user name and password to register your company in our database. You will be able to send applications, PDS (product data sheets), MSDS and also receive your pass or fail reports through this online portal. You must also complete a manufacturer survey (company information) and contact sheet prior to submitting a product for testing. An MPI testing and listing agreement must also be signed. Once you have received the user name and password, you can now complete the application with all the required attachments (TDS, MSDS, and Product Label). If the product is to be tested for an evaluated performance category or a detailed performance category a liquid sample must be sent to KTA Tator (our US lab). If it is a product that meets an intended use category – NO LIQUID SAMPLE is to be sent, just the paperwork for review! 2. Who can list a product with MPI? Only original manufacturers and distributors (with the permission of the original manufacturer) are allowed to list products with MPI. 3. What is an Intended Use, an Evaluated Performance and a Detailed Performance category? 4. On the MPI forms what does Listing Manufacturer, Label, Product name and Code mean? 5. How long is my product approved for? Approvals are valid for approximately 2 years (on the anniversary of the category testing date not the date that your product was tested) for all but recycled products (they are more frequent). On the anniversary of this 2 year period a “confirmation test” must be performed (another liquid sample must be sent in for testing) at a cost of approximately 45% of the initial testing cost. (i.e. if the initial cost of testing was $1200.00 your confirmation cost will be $540.00). If the product fails confirmation testing, the manufacturer is given 30 days to provide an explanation and a strategy to comply with the applicable MPI standard. If the manufacturer does not respond or non-conformance continues after submitting another sample, the product will be deleted from the MPI Approved Products List. 6.	Who is the contact person for the MPI Lab? 7. How do I prepare my sample for delivery to the MPI Lab? The 1 gallon sample of un-tinted white paint (or 1 quart if produced in one quart only) must be securely closed using can safety clips. 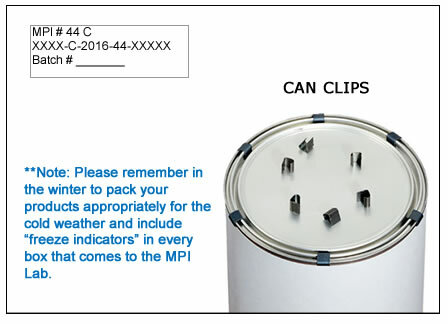 The sample must have a manufacturer’s label on the can and an additional label on the top of the can with the following information: the MPI # (category), the type of submission (initial or confirmation), the PS # given to you by MPI, the batch number of the product being sent. 8. What are the costs for listing and testing paint? The annual listing fee for 2017 is: $1597.31. A manufacturer can list a product in every MPI category (192 categories) for this one fee. If the manufacturer chooses to list more than one product in a single category (e.g. 2 products in MPI # 10, he would then pay an additional listing fee of $1439.13. For each additional product in that MPI # 10 category the manufacturer would pay and additional $1439.13. This fee is only charged upon original listing with MPI and then annually and due in the month of January. The testing cost for each product category differs as the tests required for each category are different. Here is a link to the current price list. If you have any questions about the price list you can contact Terrance Mayes, Technical Specialist at MPI terrance.mayes@mpi.net 740 438 6608. The cost to ship the paint to the lab and the brokerage fees are the responsibility of the listing manufacturer. 9. What happens when my product fails initial testing? If your product fails the initial testing for a product category, you have the opportunity to change the product if necessary and re-test it within 90 days at a reduced cost (75% initial cost). 10. What happens if my product fails confirmation testing? If your product fails confirmation testing the manufacturer is given 30 days to provide an explanation and a strategy to comply with the applicable MPI standard. You can re-submit the product for testing at normal confirmation testing costs. If the manufacturer does not respond or non-conformance continues after submitting another sample, the product will be deleted from the MPI Approved Products List. 11. What lab does MPI use for performance testing and why? MPI uses KTA Tator (http://kta.com/paint-coatings-performance-testing/) for their performance testing as they are a highly respected and qualified lab located in a US city that is easily accessible for sending paint samples. The KTA Tator lab has been accredited by the American Association for Laboratory Accreditation (A2LA) in accordance with ISO/IEC 17025 (Testing Cert. #2455.01). 12. How long does it take to test a product? Each product category has its own set of tests which take various lengths of time to complete. On average, once a product has been sent in and the tests have started it can take at least one month to complete the tests and then send a pass/fail report. There are some tests that take up to 3 months (accelerated weathering and biological testing). You can ask Terrance Mayes, Technical Specialist at MPI terrance.mayes@mpi.net 740 438 6608 for an approximate timeline once your product has been received in the lab. 13. What is biological testing and how long does it take? This testing is done on most exterior products to test for biological growth resistance to mold and mildew. This test is only performed on the sample after it has gone through the accelerated weathering test (can last up to 3 – 4 weeks). The incubation for the biological resistance test is an additional 4 weeks. Coffee – used for the cleansability testing is – Costco – “Kirkland Gourmet Coffee 100% Columbian Coffee” Brand (dark roast fine grind). Mix ratio – one pkg (52 grams single pot serving size) per 1300 ml of tap water. Brewed in a coffee machine (we use a Bunn machine). Temperature for testing must be 70° C plus or minus 2°. We only use coffee that has been brewed for less than 1 hour. No Cream or sugar to be added – black only. 15. What surfactant is used in the scrub and cleansability tests? 16. What does Erange, RG, L and GPS mean? Erange is the VOC (Volatile Organic Compounds) ranges that are now identified numerically under the heading of “Erange ”. These ranges are easily converted to a specification. The options now are E3, E2, E1, E0(outside range) or n/a (not available or verified in time for printing). E3 is the lowest VOC range, E2 the next lowest, and E1 the next lowest. Each MPI category has its own specific VOC acceptable range. RG (if it is ticked off in the MPI Approved Products List) meets the regulatory requirements of either the OTC states (or those who have adopted similar levels of VOC) or EC (Environment Canada's VOC requirements). L (if it is ticked off in the MPI Approved Products List) currently meets LEED for Schools 2009. 17. What does EPR (Environmental Performance Rating) mean? The MPI EPR rating system uses 4 disciplines to award bonus points to the specific water based categories. These 4 disciplines are: VOC, Relative Performance of the category, Gloss Level and Appropriate Specified Use. For example, the High Performance Architectural Latex categories get an automatic 3 bonus points because of the high performance of the specific category. Higher gloss levels also receive a bonus point because of the durability it bestows upon the coating. 18. What is Batch Conformance? Batch conformance is a test that is done to ensure that the product on site is the same product that was tested and approved for the MPI Approved Products List. It is sometimes required by the US Military and is contained in their specs that it may be called for. In the military instance, it is the responsibility of the contracting officer to request and take the samples of the product on site. One sample is kept by the military and one sample is sent to the KTA Tator lab for confirmation testing. The cost for this testing is the responsibility of the painting contractor and should be included in the bids for military projects. The average cost for this type of test is $600.00. KTA Tator then completes all the tests required for confirmation testing on the sample sent to them. If the sample does not pass the tests, the military may require a new batch of paint be delivered to the site at the painting contractor’s cost (the manufacturer may also be held responsible if there is a batch problem). Complete directions for sending a batch conformance product may be obtained from Terrance Mayes, Technical Specialist at MPI terrance.mayes@mpi.net 740 438 6608. 19. What type of sponges are used for the scrub machine? 3M sponges from Grainger, item # 3U163 and the manufacturer code is C31. 20. What type of sand is used for testing abrasion resistance in MPI # 27? The item number and description is ASTM 20/30 un-ground foundry sand. It comes in a 50 pound bag.